I am a webmaster, write articles, use copy and paste function serveral times to create sites.... This really saves me time and make my work a lot easier. It is one of the indispensable tools I work with. Very reasonable price. Thanks a lot! I upgrade to XP or 2000, and my data is missing. How do I Move ClipMate To Another PC? WinXP? Windows ME? Windows 2000? PowerPaste scrolls quickly through the collection. Why is that? ClipMate sometimes stops capturing clipboard updates! The toolbar/menu went away - help! Why can't I view HTML copied from Netscape? Insert a TAB character into a clip? Change the title of a clip? Change the font/color/etc., of a clip? Copy files in Windows Explorer? Restore my data from backup? Make ClipMate Startup With AutoCapture Disabled? Share A Collection With A Friend? I'm getting duplicate clips/rejects from Outlook! Do ClipMate and Office 2000 get along? When ClipMate is running, my internet disconnect dialog doesn't appear. Why does Visual Basic copy data at startup? Text prints ok, but graphcis come out blank/black/garbled. In ClipMate 5.1, the F11 key does nothing. In ClipMate 5.1, I can't maximize/resize the Traditional View window. Will ClipMate run with NT 4.0/Windows2000? Yes. WinXP runs just fine under XP. If you upgrade a Win95/98/ME system, you may run into a situation where the data seems to be missing. Don't worry, it's been moved. Read about it here. Yes, but we had to make an "adjustment" to handle some problems that occurred when copying from browsers. Get version 5.2.06 or later, which will prevent lock-ups when copying from Internet Explorer 5.5. If you use Netscape, then see this section.. Yes, and in fact all ClipMate development is currently being done on Windows 2000 Pro. Version 4 only - any service pack. All versions of 95 and 98 are supported. Version 4.26 is the last version of ClipMate for Windows 3.0/3.1. If you buy ClipMate 5, but need to run on Windows 3.x, email us and ask for a version 4 registration code. Sorry, we have no plans to port to Macintosh. It's partly a technology issue (would require a complete re-write in a different programming language), and partly a market size issue. This is interesting because the technology WILL be available in early 2001, to allow us to make a port. However, being a company that is funded by sales, and not venture capital or pie-in-the-sky IPOs, we can't commit to Linux until we see evidence of people making money selling software in that market. If you hear of any - let us know! Meanwhile, we're taking a wait-and-see approach. I upgraded to XP or Win2000, and now my data is gone! If you upgrade a 95/98/ME system to 2000 or XP, you can run into a situation where the upgrade has actually MOVED ClipMate's data directory. Since ClipMate is still looking in the old location, then it comes up empty, or with only the "trashcan" collection. Note that this only affects upgrades, and not new 2000/XP installations. The correction is fairly straightforward. You need to find where the data now resides, and then adjust the path of ClipMate's "data source" to point to the new location. Here are some generic instructions. If you have custom data sources, then these will either not apply (because XP wouldn't have moved them) or will need modification. From My Computer, right click on your hard drive and select "Search". Look In: Pick the hard disk that has XP on it, or another disk that you suspect has the ClipMate data files on it. If there are multiple matches, examine the _COLL.CM4 file in each folder, to see which one is current. Note how ironic it is that XP not only MOVED your data, but marked it as HIDDEN too! In ClipMate, go to Config | User Preferences | Data. Select the MyClips data source. Use the Edit button to open the properties dialog, and edit the path. Leave a trailing '\' character. Close all dialogs, and from the File menu, select "Reload all clips from disk". Verify that your data is intact. XP has a nifty auto-hide of "inactive" system tray icons. We're not sure what "inactive" means, but we're pretty sure that you want ClipMate's icon showing all the time. To prevent it from hiding ClipMate's icon, right-click on the systray clock, select Properties. From the Taskbar tab, you'll see "Hide Inactve Icons". It's OK to put a checkmark in that. But click on the "Customize..." button, and you'll have more options. Find ClipMate in the list, and set it to "always show". ClipMate relies on something called the Clipboard Viewer Chain, to receive notification of clipboard events (cut/copy/clear). Other applications can use the clipboard chain too, but they don't always implement their clipboard watching correctly. If they don't do everything right, then ClipMate (and lots of other apps) can be cut off from receiving clipboard updates. It's like when you leave a message for someone, and then the person taking the message throws it in the garbage can, instead of handing it to the intended recipient. When ClipMate stops reacting to the clipboard updates, then that indicates that some other application has severed the clipboard connection. Here is a quick test - select any clip in ClipMate. Now hit the PrintScreen key on your keyboard. Does ClipMate react? If not, then the clipboard connection is severed. You can temporarily restore it by either restarting ClipMate, or doing a "Reestablish Clipboard Connection" from the Config menu. If the connection drops frequently, then you have to determine what application is causing the trouble. look in Config | Clipboard Diagnostics | Connection. See what's listed as the "first app in the clipboard viewer chain". This isn't necessarily the culprit, but it may be. It is the "prime suspect". There is a "continual ping" feature on that panel (in clipboard diagnostics) which can periodically test for a live connection, and alert you when it stops. First, do a single ping, to make sure it's ok now. If it isn't then reestablish first, then turn on the continual ping. When the connection drops, it will alert you. Hopefully, you'll be able to correlate to some other application starting, stopping, or crashing. Unfortunately, there is an increasing trend for many utilities to actively monitor the clipboard for updates. (especial FTP clients and download managers). They don't always properly implement the rules, and sometimes cause big trouble. Look for these apps: FTP Clients, Download Managers, PrintScreen Utilities, Chat, Other Clipboard Utilities, Office2000/XP Clipboard. You have some other application on your system that is pasting data into itself as fast as PowerPaste can provide it. You need to find the culprit. Look for things like: Download managers, URL Grabbers, FTP Clients, and other clipboard utilities. Some applications that are known to be involved in this conflict: GO!Zilla, GetRight, CuteFTP, RoboType, Magellan Explorer, FTP Voyager, Copernic Summarizer, WinVNC. You may be able to turn off the "clipboard monitoring" feature in the other application, and thus return PowerPaste to normal operation. Office2000 has a clipboard that will also cause this. We recommend that you turn off the Office2000 clipboard if you want to use PowerPaste. Here is more information on that: Do ClipMate and Office 2000 get along? This is the enhancement to the common controls in Win95, which gives you things like the split drop-down buttons. It also includes a Y2K fix. The new version is smart enough to know if you don't need it, so if your system is already up to date, it will just say so, and quit. The update is useful for Win95/Win98 and NT4. And at 400k, it's quite painless. Just download, run the program, and (maybe) reboot. Now you'll have the updated controls. In ClipMate 5.0, you can press the F11 key several times, and it will cycle through the various preset sizes. This troublesome feature WAS removed in v5.1. ClipMate requires IE4 or IE5 to view HTML, because Microsoft has made it easy for developers to incorporate web page viewing within applications, by dropping in their ActiveX control. Netscape does not provide these interfaces for developers, so it's impossible to do this with the current Netscape browsers. If you download, unzip, and run this program, it will likely report the same error. This program is simply a form, with the Borland Delphi RichEdit control on it. There is no code in the program! Yet it errors, why is that? You have a bad DLL. Ok, now that we've proven that the problem is with your computer, what to do? The most helpful solution is to replace your copy of riched32.dll with the one that originally came with Windows95 or Windows98. Reboot your system to minimize the chances that the existing riched32.dll will be in use. When Windows comes up, hold down on the SHIFT key to abort the startup folder. Insert your Windows98 CD. Close down the Auto-Play window, and open up a Command Prompt (DOS) session. Change to your windows system directory (ex: c:\windows\system) and locate riched32.dll. Note: You'll see a bunch of files scroll by, and it'll pause at one file (containing the DLL) and copy it, then continue processing. You will need to enter Y to confirm. Restart your computer, and ClipMate should work fine now. If it doesn't work, the repeat the process for riched.dll, and riched20.dll. Do ClipMate and Office 2000/XP get along? Both Office2000 and OfficeXP have multi-clipboards of their own, although are limited, in comparison to ClipMate (for example, they are limited in size and don't remember data from one session to the next.) Additionally, they can interfere with certain ClipMate operations, such as PowerPaste. 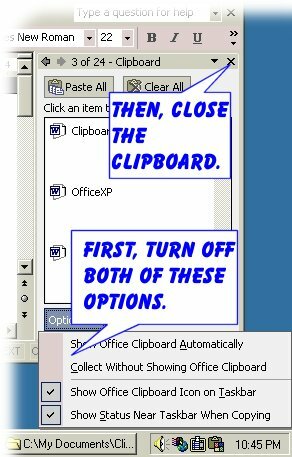 We advise that you turn your Office clipboard off, when using ClipMate. Below are instructions for each version of Office. "As you copy items, the Office Clipboard automatically appears on your desktop. You can close it if you do not want it to appear automatically. After closing the toolbar three times, you are prompted to permanently close it. If you permanently close the clipboard, to redisplay it, on the View menu, click Toolbars and then click Clipboard." Just click on either of the above links above, download and run the file to update the registry. You'll be prompted with an "are you sure" dialog, and then the registry is updated. If you want to see what they're doing first, just download to your hard disk and open with a text editor such as Notepad. Note: This registry patch won't work in Office XP. OfficeXP has a clipboard that will interfere with certain ClipMate operations like PowrePaste. Disabling it is easy. Start WinWord, and you'll see the "task pane" at the side of the screen. Within the task pane, you'll see the clipboard appear if you copy two items in a row. Now you can turn it off for good. Select the "Options" menu, and turn off the "Show Automatically" and "Collect without showing" options. There is a screenshot to show this. When you re-start WinWord, the clipboard won't re-appear. If you need to bring it back, you can do so via the menu at the top of the "task pane". Alternately, if you see the OfficeXP clipboard icon showing in the Windows System Tray (next to the clock), you can right-click on it and select "stop collecting". How do I Insert a TAB character into a clip? Since the TAB key is used for navigation within ClipMate Explorer, you can't use the TAB key to insert TABS into clips. It just tabs right out. So use Ctrl+T to force a tab character into the editor. You can use the "Tab Stops" property in Config | User Preferences | Appearance, to affect the way that tabs are displayed (new in v5.3.07). Sure! There are several ways. Right-click on the clip, and select Rename (Ctrl+R). Or, use the Edit | Rename Title (Ctrl+T) menu. Or, you can right-click on the clip and select Properties, and edit the tile in the property dialog. Or, you can highlight some of the clip in the Preview/Edit pane, right-click, and choose "set as title". How do I Capture the screen? Windows provides a screen capture factility with the Printscreen key. Press Printscreen, and a bitmap is generated, and sent to the windows Clipboard, and thus into ClipMate. Use the ALT+Printscreen combination to capture just the current window. You can print them from ClipMate, paste them into other apps, or you can export them as .BMP or .JPG files (use .JPG if you're going to Email them). If you find that ClipMate isn't capturing them (you'll get an "ignored" sound) then adjust the Application Profile (under the Config menu) to allow BITMAP capture from the application titled "Windows". You can't. The only clips that can be edited are TEXT clips. TEXT has only characters, spaces, tabs, etc. No fonts, sizes, colors, margins, pictures, etc.. There is an option to change the font that ClipMate uses to display the text. But that has no effect on the data. Pasted text usually assumes the font/color/etc., of the style present at the cursor location, when pasting into your word processor. ClipMate's primary purpose is for copying clips of data copied from within applications, such as word processors, Email, graphics programs, web browsers, etc.. Unfortunately, Windows (ab)uses the cut/copy/paste metaphor for file management as well, which doesn't fit well with the notion of an "unlimited clipboard". You see, when you copy a file in Windows Explorer, the file itself is not copied. Only pointers to the file, such as the pathname, some shell information, etc.. When you paste the file again into Windows Explorer, it uses the copied pointers to locate the original file, and move or copy it to the new location. It is therefore dangerous to assume that ClipMate has copied your data! It hasn't. If you copy a file, delete the file, and then try to paste it later, you're out of luck. Likewise, if you copy a file, then modify the contents (such as delete half of the lines with your word processor) and then try to "go back" by pasting from ClipMate, you are also out of luck. For these reasons, ClipMate does not enable file capture by default. But if you really want to, you can. Go into ClipMate's Application Profile, select the app called "Explorer", and enable HDROP and FileName. Now you can copy and paste files. But remember, the original files need to still be in the original locations, for this to work. If you get a message saying "can't read original source file from disk", then you've messed up. That being said, it is useful to have the HDROP format enabled, as ClipMate can "peek inside" and get a list of files. It then creates a TEXT version of the file list. So you can easily get a directory listing in a TEXT format. This will happen whenever you have the HDROP format present - try it! As with any application, you should regularly back-up your ClipMate data. Unlike some programs, ClipMate 5 does not store its data in the program directory. Instead, it stores it in a user-definable data directory - or in several data directories if you have created multiple data sources. You have to find the data folder (or folders) and back it up by copying the data to another disk or removable media. To be sure that you have the latest data, perform a File | Save operation in ClipMate. To find where ClipMate is storing its data, look in the Config menu, find the User Preferences dialog box. Go to the DATA tab. There is a list of data sources - you probably only have one, called "My Clips". Click on it to highlight (be careful not to "un-check" the little box to the left). It shows you the path to the data directory for that collection, in the 2nd column. If the path is too long to see, you can resize the column, or you can click the EDIT button, and you can easily read the whole path. In Windows Explorer, navigate to the data folder, or use the handy "Open in windows explorer" button in the DATA tab of User Preferences, if ClipMate is still open. Either way, you need to be in Windows Explorer, or My Computer, looking at the data folder. If you are looking INSIDE the folder, navigate "up" one level, so that you can click on the folder itself, not the contents. Now, you can copy the whole folder to another location. It can be a ZIP/JAZ/CD-R disk, floppy disk if it'll fit, tape, another hard drive, or anywhere that you feel comfortable that it's safe. If you have an automatic tape backup, simply ensure that the data folder is included in the backup. Now when we say "copy", we're not talking about a clipboard copy. Rather, a copy of the files and folders. For example, you could right-click on the data folder (ex: My Documents\Thornsoft Development\ClipMate5) and drag to another drive, and choose COPY HERE from the resulting menu. After you've copied the folder to the backup disk, open it up on the backup disk, and ensure that it contains other folders, such as short-term, long-term, etc.. Each collection has a folder, and nested collections are nested within their respective folders. If you have more than one data source, you will need to back up all of them, in a similar fashion. Unless, of course, they are shared on a network server, in which case, you should ensure that the data is backed up as part of the regular LAN backup schedule. How do I restore my data from backup? Restoring data is pretty much a backup in reverse. If you are starting fresh, run ClipMate once to establish the data folder. Look in the Data tab of User Preferences to locate the data folder, and then shut ClipMate down. Navigate to the data folder in Windows Explorer. You can delete the default short-term and long-term folders within, and replace with the contents of the data folder on the backup media. i.e. copy the short-term, long-term, etc., folders from WITHIN the data folder on the backup media, into the new data folder. Restart ClipMate, and you should be all set. If it isn't, be sure that you didn't create a redundant level of folders when you restored - remember, you're aiming for it to look exactly like it used to. So, the data folder will contain the collections, such as short-term, long-term, etc.. Don't worry about the log files. You can leave them behind. Note: In case you are rebuilding a system - make sure you have the latest version of ClipMate. You cannot use version 5.2 files with v5.1 software! How do I capture/print the screen? Windows has a built-in screen capture capability, which will send a bitmap to the Clipboard, and thus into ClipMate. Simply press the PrintScreen key to send the whole screen to ClipMate, or Alt+PrintScreen to send just the active window. You should now have a new clip, with a little Graphic icon (painter's palette) next to it. If ClipMate does NOT capture the screen, the go to Config | Application Profile, and find the entry for the application called "Windows". On the right, are the formats available. Make sure that BITMAP is enabled. Now try the PrintScreen again. For printing, you should be able to print the bitmap to any printer. If they are full-screen, they may print a bit small, if your monitor resolution is high (we stretch as far as we can, but we can't make y our paper any bigger!) So try printing in Landscape, to make better use of the paper size. Also, note that there is a new (in v5.2) option to automatically print the screen capture - see the Print Options dialog box. How do I send screen captures via Email? First, see the above topic. Now, assuming you have captured a bitmap image of the screen capture (or ANY bitmap image, for that matter), you can easily send via Email. First, you need to realize that BITMAPs are big. They can be really big. The person at the other end doesn't want to receive your screen shots as BITMAP, believe us. A full-screen, full-color bitmap can take several minutes to upload (and then download at the other end) over a modem. And they'll REALLY hate it if you put your bitmap into a WinWord document, which makes it even worse. So, we need to save time, space, and bandwith, by using JPEG Compression. Anyone with a web browser can read a JPEG, and the results usually look great, so that's the way to go. ClipMate can make JPEG files easily. Just select your image in ClipMate, and go to File | Export Clips. There is an Export Directory listed here - it defaults to wherever Windows wants you to store personal things. Make a note of it. There are several options here. The important one is "Save BITMAP as JPEG". Make sure you check this one YES. Don't fiddle with the compression quality unless you know what you're doing. To start with, turn the other options off. Say OK.
Now you've made a jpeg file, in the directory noted above. Go ahead and send the Email, and see what you get. If your Email program has the ability to accept drag 'n' drop files, then you could have chosen the option to "open export folder when finished", and you'd have an Explorer window, from which you could have dragged and dropped the files. Or, if your Email can accept a pasted filename, then the "copy resulting pathnames to clipboard" option may be of use. However, particular option sometimes causes timing problems, so get it working first, then see which options work for you. Most users want ClipMate to capture everything, all the time. However, some users don't want that. So there is the option to turn off the AutoCapture (TEMPORARILY) under the Edit menu, and the System Tray menu. That makes ClipMate ignore new clips. But it gets reset when ClipMate restarts. So, we added a new setting to v5.2. Under Config | User Preferences | Advanced, there is an option to "enable auto-capture at startup". This is normally CHECKED, meaning that it will start auto-capture when ClipMate starts. If you want to disable autocapture at startup, turn this option off, and re-start. Now you'll have a red "no" symbol imposed on the ClipMate icon in the system tray. The old way, which still works, was to add a NOCAPTURE switch to the command line. We have an online Viewlet tutorial that shows how to do this. ClipMate Collections are completely independent of one another (unless they're nested) and can be shared with other users. But you do need to be familiar with copying/moving files, and it helps to have a ZIP program like WinZip. You can distribute the data on floppy, ZIP drive, CD, Email, Etc. First, you need to know where the data source directory is on each machine. Look in Config | User Preferences | Data. That'll show you where the top-level data directory resides. Each collection is stored in there, in its own directory (folder). If you have collections within collections, then they are stored within the parent collection folder on the hard drive. The directory layout will match the collection hierarchy within ClipMate. What you need to do, is replicate the directory for a given collection, onto the other machine. Don't get into the habit of sharing collections that the other person is already likely to have, such as Short-Term, and Long-Term. That'll create chaos. If you have things in your long-term collection that you want to share, just make a new collection for the purposes of sharing. Such as Bobs_Important_Stuff. Just make the collection, copy the important stuff into it, and then you can give that away. Put your name on any collection that you're sharing. That way, if someone is collecting Recipes, for example, they won't confuse Peg's Recipes with Jane's Recipes. If Jill, Jane, and Peg all trade recipes, then it's easy to keep Jills_Recipes separate from Jane_Recipes and Peg_Recipes. If you're going to have a two-way sharing relationship with someone else, consider setting up special collections. For example, if Don and Juan are sharing, then Don will create a collection called DonJuan, meaning it's things that Don is giving to Juan. Likewise, JuanDon will come back the other way. Both users should be at the same (current) version of ClipMate. New versions can always read older files, but the reverse is not true. Close down ClipMate, or do a File | Save All Clips To Disk. In the data directory, locate the collection that you want to copy to the other machine. ZIP it, with saving subfolders, but NOT saving "extra folder info". Transport to the new machine via Email, floppy, etc. If you've done this before, delete the existing collection folder (JUST THE ONE WE'RE DEALING WITH HERE), so as not to create orphan files for clips that may have been deleted from the source machine. Unzip the collection folder into the data directory. Verify that it is there. If, for example the collection was in the "buddy" directory under the data directory on the source machine, there should now be the same folder on the target machine. Restart ClipMate, or do a File | Reload... to refresh the data. If you get a new PC (for whatever reason - we've heard hundreds) you'll certainly want to take ClipMate with you. On the old PC, make a note of the Registered Name/Number combination. You'll need this to register ClipMate on the new PC. We have help on how to find your key. Install a new version of ClipMate onto the new PC. Download the evaluation (shareware) version from our web site, and install. Enter your registration key on the new machine, when prompted after installation. Note the data source directory on the new PC. When you first run ClipMate, it'll ask you to confirm/change the data source. Write it down, because that's where you need to put your data from the old machine. Back up your data, using instructions provided here. Close ClipMate, and then restore the data from the backup, using instructions provided here. Note: Make sure you have the latest version of ClipMate on the new PC. You cannot use version 5.3 files with v5.1 software, for example. Download the latest version of ClipMate from our download page. Yes, once you're a registered user for ClipMate 5, you can use any newer 5.x version - just download, and install right over the top of what you already have. ClipMate will even preserve your registration key, so that you don't need to re-enter it. If the old version is ClipMate 5.something, then no - there is no need to remove an old version, as long as it's ClipMate 5.anything. Just install the new one into the same directory. We have a page describing the procedure. No - the files here on our WWW site contain the same program that is on the disk that we send you when you register. When you enter your personalized Registration Key, it turns the software from "Evaluation" mode to "Registered" mode, meaning that the "Nag" screens will lie dormant on the hard drive, and all features will be enabled. There is no reason to re-install, unless you have a newer version. By the way, newer versions of 5.x can always be installed over the top of existing 5.x versions. If you still have a registered version of ClipMate running, open up the About dialog, and double-click on your NAME in the About box. If you have v5.1.09 or later, your number will be revealed below. Under the Edit Menu, there is an option to Rename Title (Ctrl+T). Also, in the Editor (in ClipMate Explorer), you can select some text, then press the TITLE button, to make a title out of what you've selected. Text items may be edited in the TEXT pane of ClipMate Explorer. Set the "Run Minimized" option in User Preferences | Appearance tab. Various varieties of Outlook and Outlook Express have a peculiar habit of repeatedly updating the clipboard with the same thing, over and over. The effect, depending on the collection settings in ClipMate, is that you end up with the same clip captured over and over, or you hear the "clip rejected" sound, over and over. And it does NOT correspond to copy/paste operations. What seems to be happening, is that when you select some text in an Outlook article, and copy it, and IF you leave the original text highlighted, then Outlook will continually re-copy the information to the clipboard. It'll do it when you switch to another article or message, for example. As you open the other articles, Outlook will send the data to the clipboard again. Why, is anyone's guess. But to prevent it from bothering you, be sure to un-highlight any text that you copy. i.e. highlight, copy, and then click somewhere else, to let Outlook know: "no, I don't want that thing copied to the clipboard over and over". We've found that the "WordPerfect 7.0 Data" or "Wordperfect Data" format will retain the font/table/alignment characteristics, and won't cause problems during copying, as WordPerfect Text and Rich Text Format sometimes can. See the Application Profile in ClipMate. If you have Rich Text Format enabled, try turning it off. In previous versions, we turned off support for Quicken, because the Quicken Calculator uses the clipboard to move numbers around - so you get tons of garbage in ClipMate. In ClipMate 5, you can copy from Quicken. If you find (as we did) that the reams of calculator garbage make it desirable to turn off Quicken support, then you can do so in the Application Profile. This program has a feature where it will continually empty the clipboard, as it logs clipboard updates to a file. It's completely incompatible with ClipMate, and cutting and pasting in general. Turn this feature off, if you're using ClipMate. ClipMate can work fine with AutoCAD if you adjust the Application Profile to include everything EXCEPT Bitmap and EnhancedMetafile. Then it should copy and paste objects just fine. You hear a "POP" or "BOING" (depending on the application profile) when you launch VB6, Because they are using the clipboard to put icons onto the toolbar. This is a dreadful programmer "short-cut" which was also used in the dreaded "Internet Assistant for Word" add-in. Programmers should never do this. We have some more information for programmers here. Other abusers: Quicken (the calculator), several card games (hearts, especially). What's happening, is that ClipMate uses an IE window as its internal browser (the HTML Tab in ClipMate Explorer). IE is too stupid to know that this window shouldn't count toward its "open window count", and thus thinks you're still on the net. If you want, you can tell ClipMate not to use IE. See Config | User Preferences | Advanced. The option to disable is "Use Internet Explorer Browser To Display HTML?" Of course, you'll lose the ability to view HTML within ClipMate. The only real fix will be when IE is fixed. Although ClipMate runs fine on WindowsME, or other systems with IE 5.5 installed, something bad has happened to DDE. ClipMate used to use DDE to ask Internet Explorer what URL it was looking at. Somehow, DDE isn't working the same as it was prior to IE5.5/WinME. We've altered ClipMate v5.2.06 to not use DDE when talking to Internet Explorer - instead, it gets the information from the "HTML Format" datatype. Unfortunately, Netscape (4.x anyway) doesn't provide this, so DDE is still necessary. On some systems there is no trouble - on others, ClipMate will appear to lock-up after copying from Netscape. If this happens to you, try to close ClipMate by right-clicking on the system tray icon. Then re-start it, and go to Config | User Preferences | Advanced. Turn off the "Use DDE" option, which is only available in ClipMate 5.2.06. So update to that release if you haven't already. We are still trying to find a better solution, but this is what we have for now. Note: For more discussion on network issues - visit the Network Page. Possibly because ClipMate has a lot of toolbar icons, it can be affected by video driver problems that don't seem to impact other applications. If you experience toolbar icons turning strange colors, disappearing, or have lockups in ClipMate that aren't data related, then try decreasing the level of hardware acceleration on your video card. Click the "Advanced" button, then the "Performance" tab. Turn down the "Hardware Acceleration" to the lowest setting. After a few days of stable operation, gradually increase it. Click the "Advanced" button, then the "Troubleshoot" tab. (Note: this is NOT the same as the "troubleshoot" button on the previous dialog). Another bootup problem is sometimes related to settings. ClipMate stores many settings in the registry, such as size/position of windows, data directory location, and registration key. Sometimes corruption can occur. There is an easy way to reset the settings. Hold down Ctrl+Shift, as you start ClipMate, you'll be prompted to clear the registry settings. If you say Yes, then they'll be wiped out, and reset to default. Your registration key will be deleted as well, so try to look it up first by going into Help | Enter Registration Key (assuming that ClipMate is operational). If you want to reset just part of the registry, you can go into Config | User Preferences | Advanced, and do it more selectively. If all of a sudden, ClipMate locks up during loading, or displays numerous errors during startup, then you may have data corruption. Data corruption can happen if Windows locks up or crashes during shutdown, and usually doesn't repeat itself. There is a sure-fire way to see if the problem is related to data. Just rename the data directory so that ClipMate doesn't find it when it starts up. Then, if ClipMate starts fine, then you know it was data. If it doesn't, then it was something else (perhaps settings or video). Identify the data directory. Search your hard disk (Use the F3 search command in My Computer, after selecting the hard disk.) for a folder called "short-term". That folder is BENEATH the data directory. So if short-term is located in C:\WINDOWS\Application Data\Thornsoft Development\ClipMate5, then that is your data directory. Using My Computer, navigate to the directory right ABOVE the data directory. In the above example, that would the the "Thornsoft Development" folder. Start ClipMate. Does it come up ok? If yes, then proceed to step 6. If it still didn't start ok, then rename the folder back (remove the .old) extension, and try another angle such as Video or Settings. Data Recovery starts here. If you look again in My Computer (hit F5 to refresh) you'll see that you have two data directories now. The old one, with the .old extension, and the new, empty one, without. Identify the two directories. With ClipMate closed down, open up two My Computer or Windows Explorer windows, each pointing at one of the data directories. Copy (through copy 'n' paste, right-click drag'n' drop, etc.,) the short-term folder from the old to the new, leaving the old one intact (in case we mess something up). Start ClipMate - see if it comes up ok. If it does, then repeat with the rest. Then you're done. If it doesn't come up ok after copying over a particular collection, then we know that's where the trouble lies. Go into the new copy of that collection (i.e. "short-term" in the new data directory) and find the file named _COLL.CM4. Delete it. Rename _COLL.BAK to _COLL.CM4. Now restart. If the collection still isn't right after reverting to the .BAK file, then you'll need to either abandon the collection (delete it) or restore from a backup (tape, CD, diskette, other location on the hard disk, etc.). If you end up having to abandon a "built-in" collection such as short-term, then you can rebuild it manually in ClipMate. Make a new collection (see the File menu) and title it short-term, and give it a "sort key" of 50. Note that if you do away with both short-term and long-term, and don't have any other collections, then ClipMate will simply rebuild them, as empty. The data IS being saved, but is being sorted such that it looks like it isn't there. For this case, make sure your collection is sorting by the "mysort" or "serial#" columns. Click a column heading to sort by that column. Click again to invert. Look for your data - is it there? How old is the newest clip? If it's old, then this isn't the problem - read on to #2. There is a problem saving the data during shutdown. Copy a clip, and re-start ClipMate. Is the clip there or not? If not, then take a look at the date of the _COLL.CM4 file for that collection. See if it is current, or not. (Each collection has this file in its data folder - find the folder by right-clicking on the collection, and selecting Properties). If the date is not current, then check to make sure that this file is not marked as READ ONLY. This can easily happen if you have restored data from CD-R, which typically marks everything as READ ONLY. If it acts fine when you restart ClipMate by itself, but loses data when Windows reboots, then check to make sure you have all applicable fixes, from http://windowsupdate.microsoft.com. Copy one piece of new data, and note the serial number of that clip. Write it down. Find the log files with Config | User Preferences | Logging. UPDATE 1/3/2000 - While ClipMate handled the roll-over to 2000 without any data loss, there was one display problem that turned up. If you had your date format (in the Windows control panel) set to use 2-digit years, such as "M/dd/yy", then there was a sorting issue. If you sorted by date, it wasn't sorting properly. Changing to a 4-digit year in the control panel cleared it right up, however. The dates are all stored in long format internally, it's just that the sort routine couldn't handle the 2-digit year. The Jan 3, release of v5.1.09 fixes the problem. Version 4.5 is not affected by this issue, as it has no sorting. We have tested ClipMate 4.2 and above, for compliance with Year-2000. There are no problems that we have encountered (update - Jan/3/2000 with the exception of the date sorting issue mentioned above), nor do we foresee any. ClipMate only uses date logic for two things: Purging old data, and when running in Evaluation mode, it uses date logic to determine whether or not to "nag" the user. To the best of our knowledge, current versions of ClipMate are Y2K compliant. We have tested it extensively, and have found no problems with Y2K. This is an obsolete function in v5.1. In ClipMate 5.0, we introduced a feature where ClipMate had several "preset" sizes, and F11 would cycle through them. But this was a big point of confusion, and one out of every 3 tech support calls was "I've lost my menu/toolbar, and can't get it back." So now we've taken more conventional approaches to hiding the menu and toolbar. The toolbar can now collapse, and the menu can be hidden from the View menu, and restored from the system menu (little box in the upper-left of the window. The Traditional Window (and QuickPaste as well) is intended to be a drop-down window only, and not resizeable horizontally. Why? Because it's really the same window as ClipMate Explorer, and if you stretched it horizontally, you'd be exposing parts of Explorer that aren't active in Traditional View, and chaos would result. So the width is "locked". In v5.1.04, we re-enabled the MAX button. It will take you from Traditional View into Explorer. Click again, to maximize Explorer. The Restore button will take you back to Explorer, or directly to Traditional View, depending on how quickly you cycled up from Traditional View. If you clicked through in under 5 seconds, it knows to take you back to Traditional View. Will ClipMate run with NT 4.0 / Windows2000 / XP? ClipMate 5 is fine on NT4 and Windows2000, ME (and now XP). Text prints ok, but graphics come out as blank/black/garbled. Help! Get v 5.1.09, and go into the File | Print Options dialog, and use the new "override color depth" feature to reduce the colors to 8-bit, 256-color output. That should take care of it. I just installed v4.5/5.0, and it doesn't print graphics properly on my HP Laserjet 5si. NOTE: First, try the tip above, using the Override Color Depth option. This section is intended for anyone who needs to network ClipMate, or manage a large number of ClipMate users. ClipMate can run on the network, or it can run on the user's hard drive. It does require a "home directory" for the user's data to be written to. So you need to set the Data Directory to point to a directory where ClipMate can write to. Such as their home directory on the LAN, or back at their C: drive. Normally, you'd set this in the DATA tab of User Prefernces. Simply visit each workstation, and add a data source. Overwrite the default name of "new collection", calling it something like "Workgroup", "Tech Support (Shared)", etc..
To use the registry method, make a registry file, and simply run the file on each station - you can Email it to each user as an attachment, and have them run it that way. To make a file, run the regedit program, navigate to the key listed above, and export to a file. It looks like Windows2000 uses a file format that isn't friendly to text editors, so be sure to export as the older "Regedit4" format. Look under the File | Export menu, in regedit for this. The Regedit4 format can go forward into a Windows2000 system, so this seems to be the easiest way. Here's a sample file (you can view the file in Notepad, or any text editor) showing the registry entries exported. The first key just establishes the tree. Next, is the "_Dirs" key. Very important, this contains a list of the data sources. Each data source, in turn, is listed in its own key below. So, two things need to happen to add a data source via the registry. It needs an entry in "_Dirs", and it needs its own set of entries. If you are deploying to workstations that already have local directories, then you can hack out the local information out of the .reg file. i.e. remove the "my clips" entry from the "_Dirs" key, and then get rid of the whole "My Clips" section. On the other hand, if you are starting fresh, you can pre-program ClipMate to locate the "My Clips" in a pre-determined location. It must be a fixed location though, and not variable by userid, as I don't know of a way to use variables like %userid%. If you have each user's home directory mapped to a drive letter though, such that "H:\" maps to a distinct directory for each user, that's a good way to go too. Use this same technique if you want the program executing locally, but storing all data on the LAN. It's the same situation, really. Note that UNC filenames aren't supported at this time. You need a mapped drive letter. Also, your LAN must support long file names. Otherwise, you'll need to keep the names of collections within 8 characters. At startup, ClipMate will load all collections found in this directory, giving them read-only status. The idea here is that one user would be the "owner" of a given collection. That user would have the collection locally, and would maintain it for the group. When new information was to be made available, it would be copied up to the network drive, and everyone would then see the changes at next startup (or if they select File | Re-Load). If the newer version of a collection has any items that have been DELETED, it is important to have everyone close and re-start ClipMate as soon as possible, to avoid any "file not found" problems, if they try to access the deleted item. It is perfectly safe though, to add collections while users are working. Have a designated user (the "master user") create one or more collections on their own hard drive (in their normal ClipMate environment), and populate with the appropriate clips. Have the"master user" close down ClipMate, and move or copy the collections from the "master user's" hard drive to the shared folder. You can use Explorer to locate and move the folders. They're right in the "master user's" data directory, along with their other collections. Don't worry about the contents of the individual folders - take the whole folder, contents and all. Now for each user, add the shared workgroup directory (see the above topic for tips on how to deploy using .REG files). When they start, they'll read in the shared collections, in a read-only fashion. Or, use the File | Reload option to read in the new data. Updates happen from the "master user's" PC. Just copy the shared collection(s) down to the master user's pc, re-start ClipMate, make the changes, close ClipMate, and copy them back up. As you can see, any user can be a "master user" this way. Instead, you can just install ClipMate on each computer, and use a registry file to register the software. You simply register the software on one station, export the information to a .REG file, and then and simply run the file on each station. Or, you can Email it to each user as an attachment, and have them run it that way. Note that this is never necessary for upgrades - the key resides in the .ini file, and isn't overwritten during installation. NOTE: Yes, you can make a .REG file with all of the changes you need, including the primary data source, shared data source, and registration key.